I’m always amazed by how well my dogs remember places and people on our travels. They never know where we’re going or how long it will take to get there, but they sure as hell know when we’ve arrived somewhere they’ve been before. 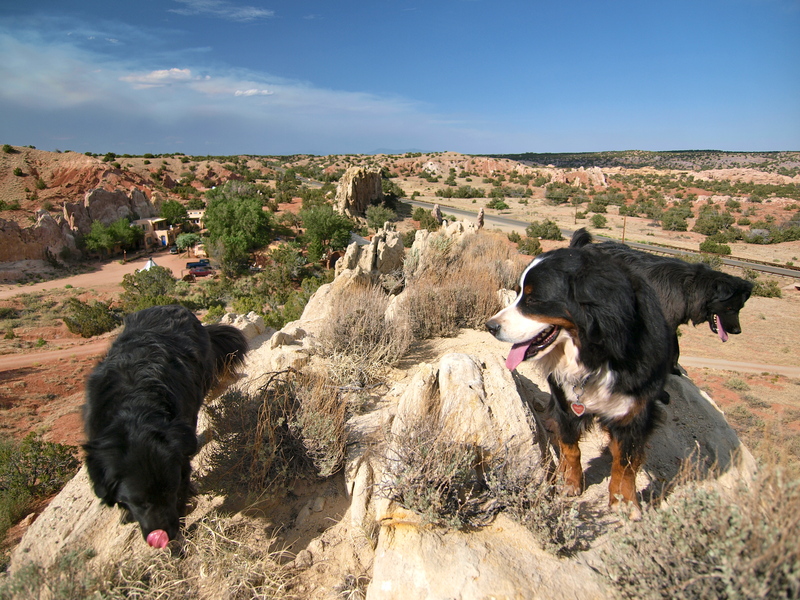 Driving down the Turquoise Trail, south from Santa Fe, as soon as a we passed the distinctive gateway of rocks that flank the road at the Garden of the Gods, my dogs knew where we were. 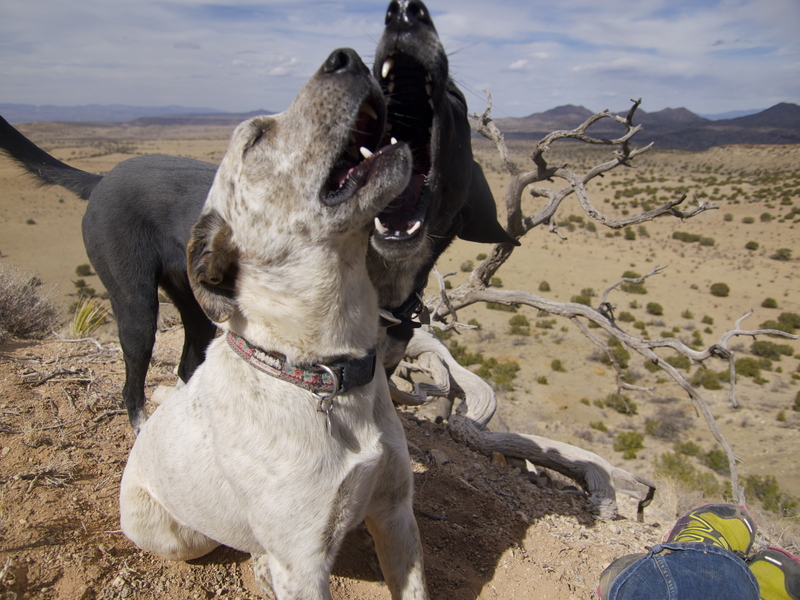 After a year away from New Mexico, when they saw those rocks, they both sat up and started wagging, panting and whining with excitement. All week, I’ve been reveling in this land, revisiting rocks and trees, arroyos and overlooks, enamored by how well I remember where my paths run across this unmarked expanse. I wonder whether this desert remembers me. The ravens, the coyotes, the horses, the hares — do they see me, smell me, hear me hiking across their land and think, oh yes: Her. I don’t presume to be missed by this place, but I like to think I am remembered. No doubt, the dogs remember me. Every time I walk up to a friend’s house and whistle, their dogs come running, barking a low warning reserved for strangers, then, invariably, their barks rise in excitement and they launch at me, clawing, licking, whining, leaping, ecstatic that I smell like an old friend. Even Trinity, the damaged Bernese whom I used to have to coax into my hands, came running, unreservedly happy to see me. Dog joy is pure joy; I feel so blessed. And, of course, I went to visit the Blonde Coyote. My first day out here, I hiked out to my favorite spot: the precipitous edge of a mesa, overlooking the Earthship a mile away across the flood plain. I stood there and whistled and saw two specks, one black, one blonde, run out from the walled yard, barking. My heart nearly stopped. Surely they hadn’t actually heard me (Freckles is stone cold deaf) or seen me or smelled me so far away. 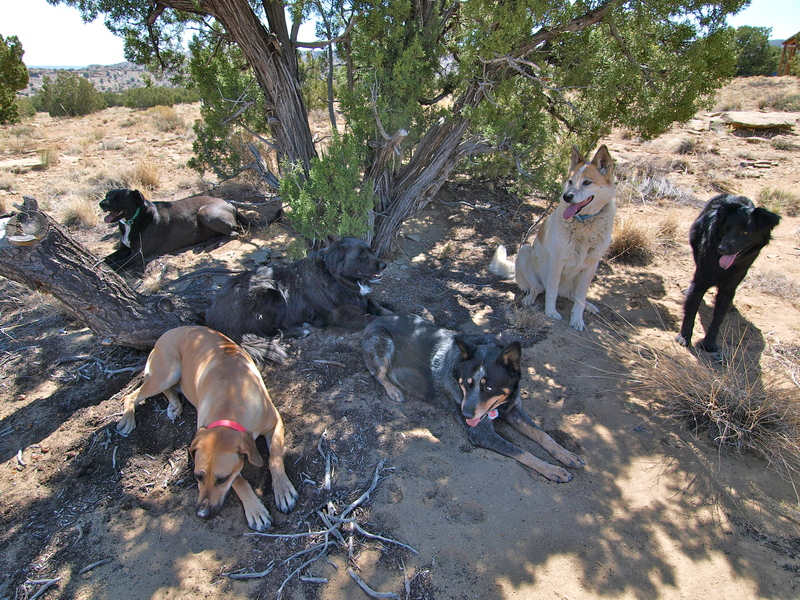 But they weren’t running south towards the mesa, they were running due west and when I tracked their trajectory I saw several reddish brown dog-sized specks leading the chase: coyotes! Wild America lives in this big backyard. 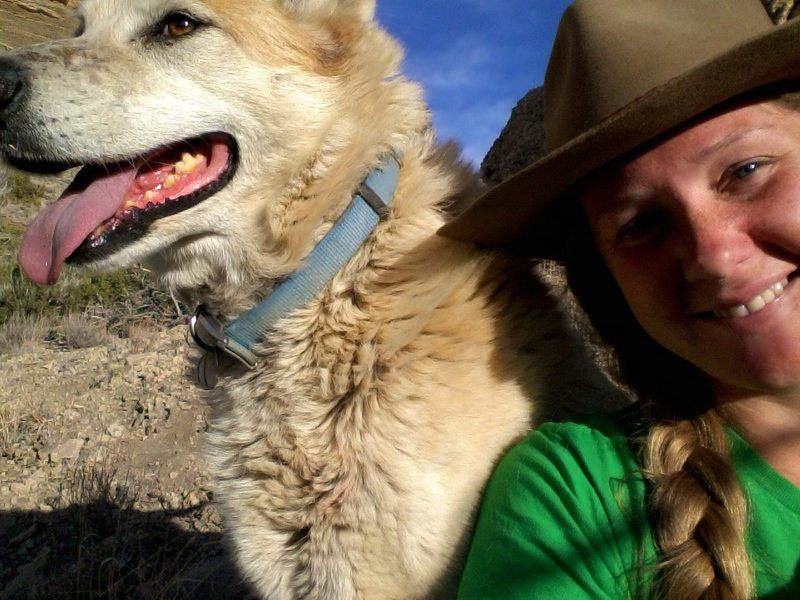 The next day, the Blonde Coyote and I had our reunion. I found her on the hill behind the house, deep in a deaf dog’s sound sleep. I tapped the ground with my foot and she woke up and started to shy away – she’s very skittish – and then caught my scent and reversed course, right into my arms. One molecule and she knew me, one step and she was ready to follow me anywhere. Come on girl, let’s hike to the horizons. 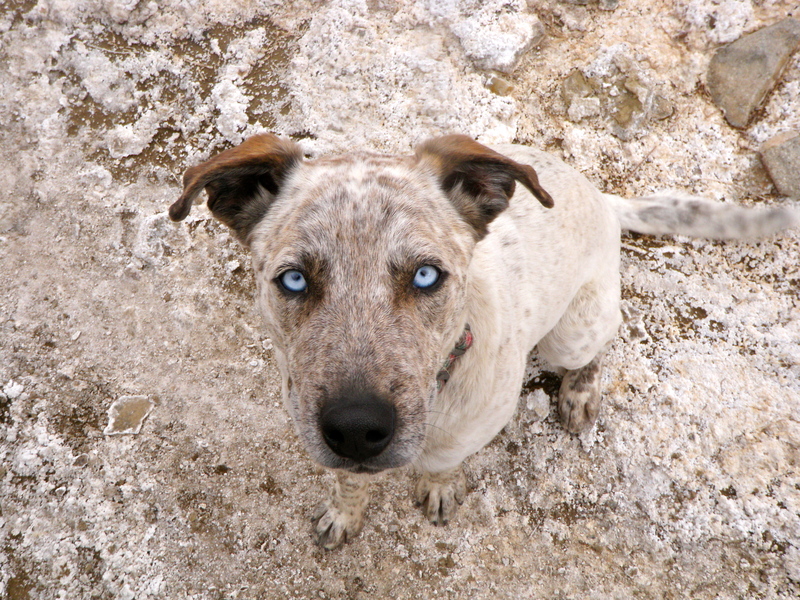 This entry was posted in Bowie & D.O.G., Hiking!, New Mexico, Photography, Road tripping!, Vagabonding 101 and tagged dogs, memory. Bookmark the permalink. Nice ! Love the group doggy photo !! lovely and LOVE Bruce’s first pic. 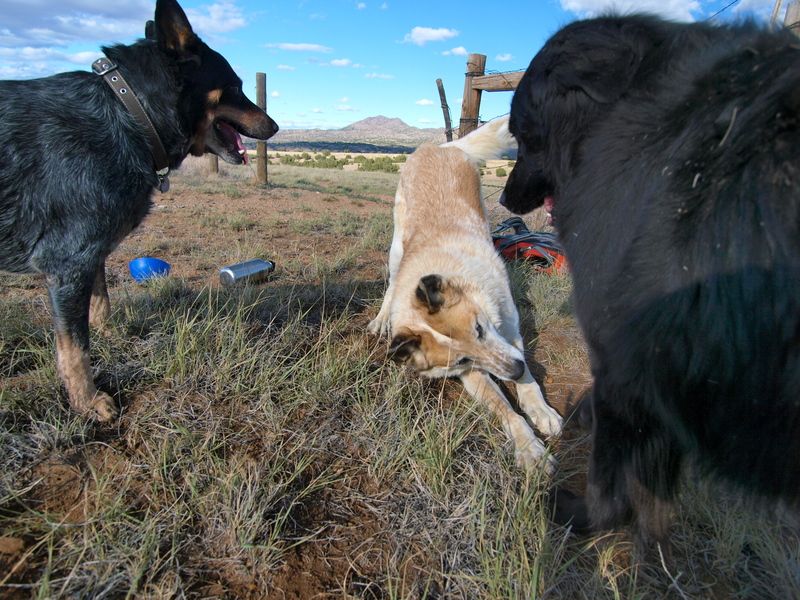 Amazing post, thoroughly enjoyed reading this and your observation of dog joy- so true! You really ARE like the dog whisperer!! Love the pics! The best, happiest, truest smiles I’ve ever seen have always been on dogs. Their charm is irresistible 🙂 Can never get enough of happy dog pics.